Panda was handled by Carol Grossman. She finished her AKC championship with 4 majors. There is so much to be said about Panda. I could never write enough. She was so much more than just our Foundation. 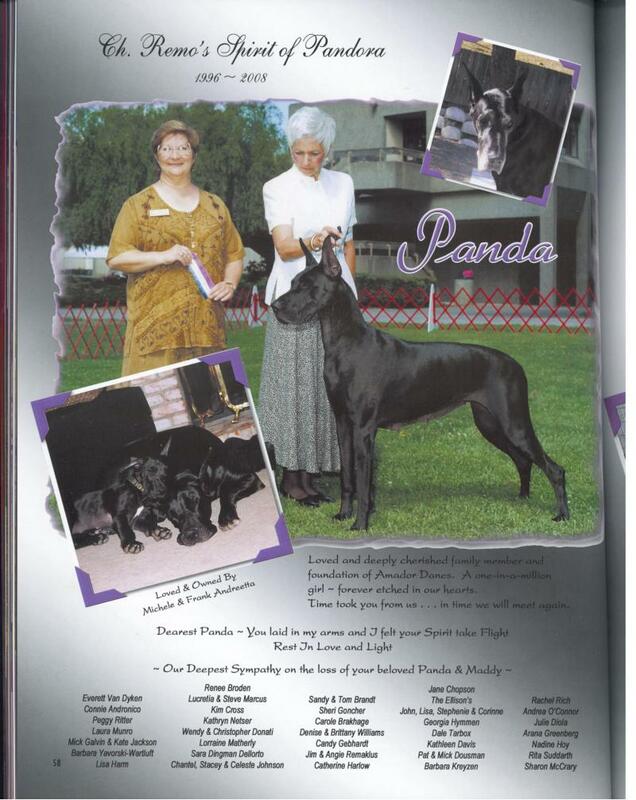 Panda was, and still is, the very Heart, Soul & Spirit of Amador Danes. She lived 12 fabulous years, having never had a sick day in her life. She lived completely vet free. The only times she ever saw the vet, was when she had her puppies, when she was spayed, and finally to help her cross the Bridge. We helped our Precious Panda cross the Rainbow Bridge simply because it was her time. Time took her from us, just time. We will never live one day without thinking of our Beautiful once in a lifetime Panda. Her Spirit lives on in her children, grandchildren and beyond. At the time of her passing, she left behind 18 veteran children (from Chase and Troy) between the ages of 8 and 9- who like her have lived very solid lives. We cherish her double grandson, our Patrick, who is so much like her in looks and Spirit. He is an extremely caring and caretaking Spirit, as was Panda. WE LOVE YOU PANDA, ALWAYS & FOREVER. YOU'LL LIVE IN OUR HEARTS AND SOULS FOREVER.